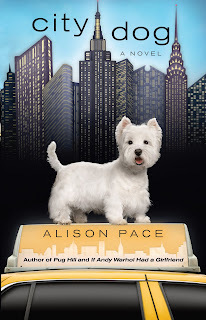 Amy and her West Highland white terrier, Carlie, live in New York City where Amy dreams of writing The Great American Novel, but finds herself writing a best selling children’s series instead staring Carlie. Her writers block transfers to the children’s books, so to avoid questions by her agent and editor she reluctantly agrees to star, along side Carlie, in a television show about them, when things start to go wrong. Unfortunately this single girl tale didn’t grab me as much as I would have liked. I’m not sure I’m the best judge though, having not only recently separated from my husband but left my dog with him as well, and I found myself struggling with this chick lit novel. The concept of three narrators was interesting and I laughed at the Carlie’s narration, amused because I could just picture the doggie thoughts racing and distracted. Alison Pace definitely has the doggie antics down. But I wasn’t sure about Robert McGuire’s narration. I found myself jumped out of the flow of the novel, which Carlie’s also did, but I was more amused with the doggie thoughts than those of Amy’s fictional character. I also grew tired of Amy’s lack of movement forward. She came across as very depressed and with it being three years after her marriage dissolved, I wanted to shake her to get it together (and prayed this won’t be me in three years – see, maybe not the best judge). I didn’t feel much connection to her, or any of the other characters really and wasn’t sure about her love interest, nor did I feel much of a connection even between them. In the end, I was left with how wonderful doggie love is and how much I missed my dog, but didn’t take away much else from this novel – except maybe how I don’t want to be in the same place as Amy three years from now! I had high hopes for this book as the dog has her own voice and full chapters are dedicated to a dogs’ musings on life- should have been hilarious- but unfortunately the novel wasn’t very funny at all. Amy is sorting out her life after a divorce and is trying to write the “great American novel”. Her focus though is on the successful children’s books about her own dog, Carlie, for which she is trying to write the fourth instalment. City Dog doesn’t have much more of a plot than that and Amy is a bit blank for me. The plot has tiny ups and tiny downs and not much going on in between. I had a hard time getting comfortable with Alison Pace’s writing style. The writing was good but Amy’s voice was almost entirely introspective and this didn’t leave much room for dialogue or warmth. I found, mostly at the beginning, that there were phrases clarifying her past stuck in amongst her current thoughts which was confusing and frustrating. The other characters had lots of potential but were given very little depth and some of them were of very little consequence to the storyline. The exception for me being Bonnie, she was great and could maybe have her own novel next! My favourite part of City Dog was the moment that all the characters are brought together to watch a TV pilot at Amy’s apartment- my favourite because there was dialogue and emotion felt by Amy at this point and we’re finally given some insight into her as a person- but it’s short-lived and we’re quickly brought back to the original writing style. All in all I wish that I had felt more for Amy and that Carlie had been given more of a voice to create some comedy and to establish a love of the reader for Amy. Thank you to Alison Pace for our review copy. All opinions are our own.